Four-spotted Chaser (Libellula quadrimaculata). Male. Taken at Farmoor, Oxon., on June 2nd 2018. Approx 3x lifesize. Male. Taken at Farmoor, Oxon., on June 2nd 2018. 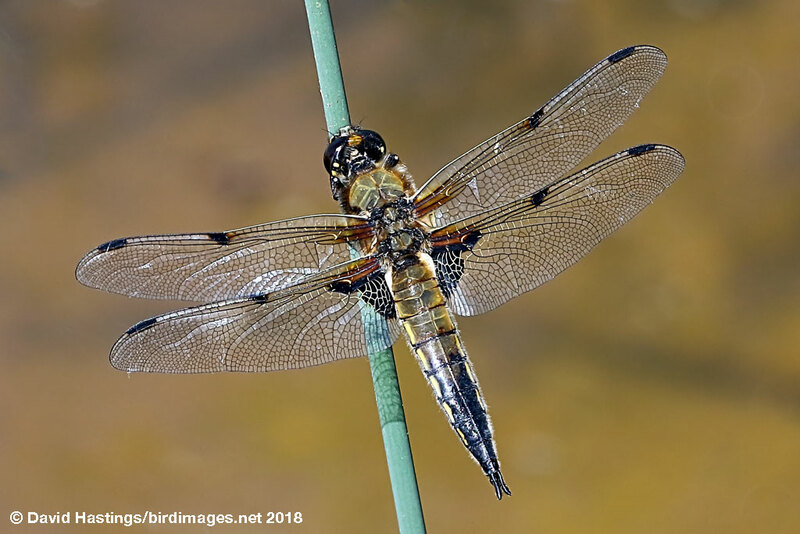 Four-spotted Chaser (Libellula quadrimaculata). Male. Taken at Otmoor, Oxon on April 30th 2011. Approx 3x lifesize. Male. Taken at Otmoor, Oxon on April 30th 2011. Four-spotted Chaser (Libellula quadrimaculata). Female. Taken at Otmoor, Oxon on May 20th 2007. Approx 3x lifesize. Female. Taken at Otmoor, Oxon on May 20th 2007. Four-spotted Chaser (Libellula quadrimaculata f. praenubila). Male. Taken at Whelford Pools, Gloucs, on June 14th 2017. Approx 3x lifesize. Male. Taken at Whelford Pools, Gloucs, on June 14th 2017. A medium-sized dragonfly. The sexes are alike, with a brown abdomen becoming darker towards the rear, a brown thorax and brown eyes. There is a row of yellow spots along each side of the abdomen. The most noticeable feature is the colouring of the wings. The nodus (half-way along the leading edge of each wing) has a very dark spot, which gives the insect its name. The wing bases are also dark. A colour form "praenubila" has a general darkening of the wing tips. 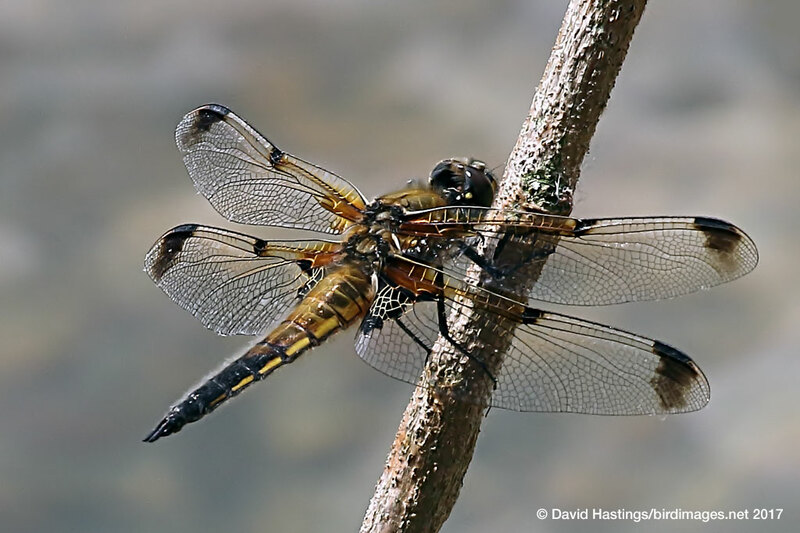 The Four-spotted Chaser is found throughout the British Isles. It can be found in a wide range of standing waters, but the largest populations are associated with acidic heathland pools. It rapidly colonises new sites. Mating occurs in flight, and is very brief. Eggs are laid in flight. They hatch after about four weeks and the larvae live in decaying plant debris. Nymphs take at least two years to mature into adults. The flight period is from late May to July. Males are aggressively territorial, taking up positions on bankside or emergent vegetation, from where they launch missions to chase intruders or intercept a female. Favourite perches are usually around three feet off the ground, making identification and photography easy. A common and widespread species.